Have you ever noticed how medicine commercials for common cold have this one human figure , who always is Glowing, or has a bright aura, or is always being attacked by monsters, or certain areas around the nose have caught fire , areas around the head have incoming arrows? I am that human figure today and my nose is changing colours, between Yellow and Red. Thankfully there aren't any arrows pointing all over my body ( signifying body ache). Thankfully my brain has not become Red in colour (indicating head ache). I am simply suffering from common cold. A set of symptoms that we call Common cold are caused by a viral infection of the upper respiratory tract( Nasal cavity, Pharynx, Larynx). This may happen due to infection by a variety of viruses, as many as 200, Rhinovirus being the most common. Essentially, there is no such things as common cold that we refer to. These are only symptoms caused by the several viruses that may affect the respiratory tract. The virus deposits itself on to the cells of your nose and causes cell damage. Our body senses the presence and as a defense mechanism trigger the release of inflammatory mediators. Inflammation ( Etymology: Ignite/set alight) is a part of a response to harmful external stimuli. This is a part of the mechanism of the Innate Immune System , also known as the Non-Specific Immune system i.e. the first line of defense. This inflammation and activity of the non-specific immune system then produce the symptoms of common cold i.e. running nose, irritation, sore throat etc. Infact all these are an indication that your body is fighting the virus to eliminate it from the system. As a defense mechanism the system opens up the blood vessels and releases more fluid and white blood cells to get rid of the virus that caused cell damage.The extra fluid gives you a running nose and the stuffy feeling. Funny, that that it is infact your own body that causes the symptoms of a common cold.. for your good albeit! Catching the virus from a door knob/money/ infested surface etc. Inserting infested fingers into your nose .. hahahaha.. always funny!! Why is it called common COLD? Does it occur only during cold weather?No. During winters our nasal passages become dry and thus it becomes easy for the virus to pass through the passage, but again it only requires entry into the nasal package. During the cold season people stay indoors and gather in crowds indoors which facilitates easy person to person spreading of the virus. Also, may be we avoid washing our hands in winters as frequently as we would normally do. Does taking Zinc and Vitmain C tablets help in alleviating the symptoms? No. Studies suggest that taking daily doses of Vitmain C only shortens the duration of the cold.Thus, an average adult only suffers ONE DAY LESS a year from old, if he/she has taken high doses of vitmain C that year. Zinc also has minimal benefits. Let the body do its job! It knows what to do! Is Suryanamaskar really the Mother of all exercises? When you're surrounded by the glamour of Bikini Babes flaunting their toned bodies and Pumped Hunks showing off their six packs , it is easy to conclude that Lifting weights and spending time in the gym is the only way to get to your dream body. However, our elders weren't crazy to swear by The Suryanamaskar for achieving long term permanent fitness oriented results. Oh, Suryanamaskar isn't cool enough for you?? Call it "Sun Salutation".. How does that sound? Cool eh? Position 1 - Pranamasana: Stand with feet joined and hands folded in front of the chest and exhale. Position 2 - Hastha Uttanasana: Raise hands and bend backward as you inhale. Position 3 - Uttanasana: Bend forward and place the hands flat on the floor as you exhale. Position 4 - Ashwa Sanchalanasana: Stretch the right leg back while bending the left knee & lowering the torso as you inhale. Position 5 - Adho Mukha Svanasana: Now lift the hips, take the left foot back to join the right foot while lowering your head. Your body should be in a triangular position. This should be done as you exhale. Position 6 - Ashtanga Namaskaram: Now lower the body to the floor and let the chin, chest and knees rest on the floor but not the stomach. Your pelvis will not touch the ground here. 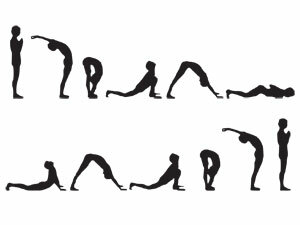 Position 8 - Adho Mukha Svanasana: Lift the hips up to the triangular position and exhale (same as Pose 5). Position 9 - Ashwa Sanchalanasana: Bringing the left foot forward, you should inhale (same pose as pose 4). Position 11 - Hastha Uttanasana: Raise hands above your head and bend backwards and inhale. Position 12 - Pranamasana: Fold hands and bring them down to the chest to come back to the starting position and exhale. Who should avoid/consult a doctor before starting Suryanamaskars? Those who are moderately fit ,and are given a go ahead by doctors to perform this wonderful set of postures , can be sure that their chances of falling into the above'Who should avoid' group will be significantly lower as compared to those who do not perform surynamaskars. How many suryanamaskars should one perform? Begin doing it, even if it is just one , two or three. Increase gradually to 10, 20, 30 and more as you build stamina and improve your strength & endurance. So, to you all, Happy Sun Saluting!! Wine helps: are you consuming 60 litres a day? So I was at a friend's place. It was a Friday night. Everybody was intoxicated by their own respective poisons. Some were busy mixing up different varieties of poisons , some were happy with large amounts of their own preferred poisons.. some were acting poisonous because of not consuming any poison! I noticed one of my friends consuming Red wine. He was a Beer head! I couldn't help but ask, " Why Wine?". He said " Wine is good for health!" ... I asked "WHY?" .. He replied, " It's good for my heart you Buzzkill!! 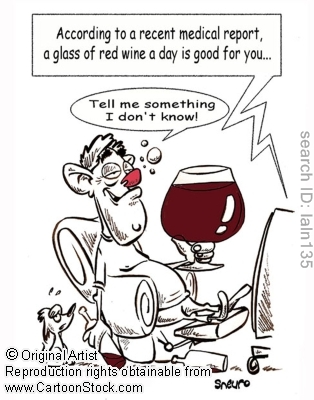 Now let me drink in peace"
It was only natural for me to do some research on Red wine and find out what the truth is.. Does Red Wine really improve my health? There is no clear conclusive evidence of the same.There is no research that categorically states that 'x' ml of Red wine daily can cure 'y' disease or bring 'xyz' levels down in the body. Why the Buzz around Red Wine? 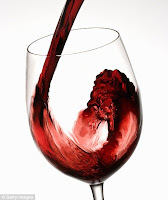 One of the components of Red Wine is RESVERATROL ( an Antioxidant) , which is believed to bring down LDL Cholesterol ( More on Cholesterol here), prevent damage to blood vessels and prevent blood clots, is the main reason for the buzz around Red Wine. So does Resveratrol really Help?? IF Yes/No, why? Most research that has been done on Resveratrol , has been done on Mice and not on people. So what? If it's true for Mice, it might help me too?! But evidence is positive, should I start consuming Red Wine? So , if I consume Red wine instead of Beer/Whiskey /Vodka , will it help? There is no conclusive evidence on this. There is a chance all may be equally good/bad , however you want to look at it. Hence, there is no reason to start consuming alcohol , if you don't. And if you are a passionate Wine lover, don't overdo it. Moderation is the key to enjoy benefits, if any , from consumption of Red Wine. 1.5 ounces (44 mL) of 80-proof distilled spirits. Enjoy your drinks... once in a while!.. Cheers!! Don't be wooed by products promising to be low on "Cholesterol" , because if you don't consume enough cholesterol, your body will make up for it... your liver, to be precise! For some, the contents of this post may be too hard to believe, but my mission is to debunk myths, no matter how ridiculous they might sound right now. To give you an analogy, there was time when somebody who said that the Earth is ROUND was considered insane. OR there was a decade during which Smoking was not considered harmful... But over the time, research and scientists suggest otherwise.. This is one of those things.. These days , everyone you know is talking about lowering ' Cholesterol ' , which is thought to be a leading cause of Heart Disease. ( Few can spell it correctly with an 'e' after the 't'). Here's the shocker: Our body is the most efficient manufacturer of Cholesterol ! How can something so harmful be produced by the body then??? How can our very own liver & intestines produce cholesterol? Not only that, the liver produces 75% of your body's required cholesterol and sends it to wherever in the body, it is required. Also, if you don't consume enough cholesterol , your body will produce the required amount on its own for its use. All this happens because, our body requires cholesterol!! It is used to build and maintain membranes. In the liver, Cholesterol is converted to Bile which aids in absorption of fat along with Fat soluble Vitamins like A,D,E,K in the intestines. The above are NOT types of cholesterol. Cholesterol is simply cholesterol.HDL and LDL are types of proteins. Cholesterol makes its way to and from tissues by combining itself with other proteins , since fat and our watery blood do not mix well. 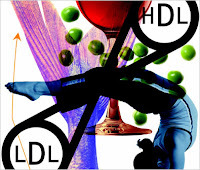 (HDL and LDL are those proteins). If cholesterol is not the demon, then what causes heart disease? Heard Disease is caused by Inflammation of arteries casued by Oxidation of LDL , not due to concentration of LDL. How does Oxidation of LDLs occur? Oxidation of LDLs occur when LDLs react with Free Radicals and other factors. Other important pointers to reduce Oxidation of LDLs? OK, But What the hell are Trans- Fats now?? Trans Fats are those fats that are not occur naturally and are usually solid at room temperature. Trans fats are formed during hydrogenation. Hydrogenation is a process by which unsaturated fats are bombarded with hydrogen. These are commercially used in foods to extend their shelf life or to add texture/taste to the food. So don't be wooed by products promising to be low on "Cholesterol" , because if you don't consume enough cholesterol, your body will make up for it... your liver, to be precise!